Favorite Organizing Links ~ Command Central, Decluttering Tips, Free Printables + more! I missed posting this last month but better late than never right? For those that don’t know this monthly feature here is where I share my very favorite organizing posts with you from around blogland over the past month (or two). Many of them I’ve already shared on my Facebook page or on my Pinterest boards but I wanted to select a handful of my very favorites to share here today for you as well. I really love having these fabulous links all in one place although it’s always so hard to narrow them down that is for sure. This time I’ve once again chosen 18 to feature! I also want to invite you to link up your favorite organizing links as well so we can all share in the organizing LOVE. This exchange of organizing awesomeoness is so FUN! 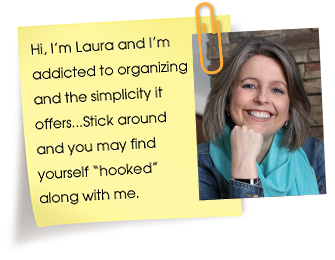 I love when my readers fuel my habit with a hit of organizing bliss. Woohoo! I reserve the right to delete irrelevant links. Also I don’t even require a link back to my site although that would be nice if you wanted to share the love! 14 Responses to Favorite Organizing Links ~ Command Central, Decluttering Tips, Free Printables + more! So many great resources here. Thank you! Bookmarking for sure. Thanks so much for featuring my command central! I really appreciate it. Thanks also for hosting this link party. It is always so much fun to look through and get great ideas. Have a great night! This is a great resource for everything I need to know. Thanks for sharing this. Do you have some tips for organizing computer files including emailed coupons? Thanks for all the great links!! I’ve already pinned some of them. thank you so much for choosing my organized receipts!!! 🙂 you are too sweet! i’ll link up a few org posts of my own too. and i love to look at what everyone else is sharing – so much inspiration out there! Love! Thanks for sharing all in one place. and neck of one’s body, You have a muscles on either side of your spine that connects your pelvis and runs approximately the base of your skull. A compression fracture could potentially cause permanent changes on the shape and structure with the spine. If the problem causing the disc to bulge just isn’t alleviated, it could result in a full disc herniation. This strategy is done by utilizing an especially designed apparatus. underwear can make a warm and moist environment for the yeast to flourish. it can save you money while shopping from online stores. homebrew channel has certainly added a wealth of replay value for the otherwise excellent console.